Sotherton, who played netball for Hampshire as a teenager, won two English Schools’ in the heptathlon, as an inter in 1992 and senior two years later. She won the 1995 AAA U20 title and went on to make her junior international debut that year. She improved considerably in 1997 with a PB of 5513 and also took her long jump best to 6.10 (and a wind-assisted 6.16m). The following winter she took silver in the AAA indoor 400 but it was 2000 before she got back to form following a knee injury. Sotherton’s senior GB debut came in 2002 when she finished third in the Five Nations International in Zaragoza, improving her 60m hurdles and shot PBs en route to a new pentathlon best of 4188. She followed up with AAA titles in the long jump and the pentathlon and in the summer her heptathlon PB was improved three times, finishing the campaign with a best of 5794 at the European Cup. Victory in the 400m hurdles at the Cup Final, in a PB of 58.72, brought thoughts of moving to that event during 2003 but she enjoyed such a successful campaign and broke into 6000 points territory that she later quit her job to concentrate fully on the heptathlon. The indoor campaign in 2003 brought her another AAA title in the pentathlon and a heptathlon PB followed in Gotzis but it was really the European Cup for Combined Events that saw her make a major breakthrough. A spell training in the States had been the platform for a successful summer and in Tallinn she broke 6000 points and qualified for Lottery funding as she recorded a score of 6059. She recorded an indoor long jump best of 6.38m at the European Indoor Cup in 2004. ISLE OF WIGHT heptathlete Kelly Sotherton Sotherton has one last stop-off in Britain before jetting out to the Olympics Games in Athens. She will be going all out to crack the Olympic long jump qualifying distance at Crystal Palace tonight - irrespective of whether she can double up in Athens. The 27-year-old Isle of Wight all-rounder is already guaranteed an Olympic place in the heptathlon, in which she currently ranks third in the world, but she is a tantalising two centimetres short of the A long jump standard, having leaped 6.68 centimetres in Poland last month. Tonight she faces a classy international field in the Norwich Union London Grand Prix, including Jamaica's world leader Elva Goulbourne, British number one Jade Johnson and Olympic heptathlon champion Denise Lewis, Sotherton's friend and training partner in her adopted home city of Birmingham. Johnson is Britain's only women's long jumper currently selected for Athens and Sotherton is unsure what would happen were she to achieve the 6.70 target just five days before she jets off to the Olympic holding camp in Cyprus. She said: "It's a perfect event to double up in because there's a four-day gap between that and the heptathlon (August 20/21). It would be nice if the selectors could reconsider and select me for the long jump, but I'm not relying on it. If I'm picked, I'm picked and if I'm not, I'm not. The heptathlon is the most important thing." Kelly Sotherton continued her impressive countdown to the Olympics with a double win yesterday. Competing in the Norwich Union three event challenge in Birmingham, the Isle of Wight girl won the 110m hurdles in 13.62s and the high jump with a leap of 1.76m - three cms better than her nearest rival, guaranteeing her overall glory, but she was fourth, the javelin, with a throw of 35.27. Sotherton was fourth in her problem event, the javelin with a throw of 35.27. Sotherton, a training partner of Olympic champion Denise Lewis, was critical of her own performance. "There was a great crowd, which always helps, but I obviously have not listened to all the advice Denise Lewis has given me because I didn't use any of it! I did okay, but I was a bit under par and felt a bit lacklustre. "I think I expected too much from myself, which put me under too much pressure, but I got through it, so that's okay. "I am disappointed with my javelin. I have thrown five metres further than that, but the javelin is only one event in seven. "I am learning so many new things, so it's hard for me to put it all together." Kelly Sotherton (Birchfield Harriers) can just about afford a quiet smile when she hears people talk about Lottery millions helping to buy Team GB success at the Olympic Games in Athens. She knows how the story started. Millions have been spent on modernising the facilities for the UK’s sportsmen and women over the past half dozen or so years and the Birmingham High Performance Centre at the Alexander Stadium has been a major factor in her emergence among the World’s best heptathletes. But she also knows better than most what a giant misinterpretation it is when people start chatting about the sports people themselves picking up millions to help their pursuit of glory in an increasingly professional environment. Sotherton herself gets by on £570 a month. That’s £6800 a year. “It’s tight, very tight; I’m really skint,” she says of her budget – though she is something of a financial expert, having given up a career in banking to pursue her Olympic dream. And don’t get her wrong. She’s not complaining about the low pay. On the contrary, she is adamant that her great advances this year have been due to the fact that last summer she earned a place on the UK Athletics World Class Performance Programme, funded by UK Sport from the Lottery. It did not take her long to match her hopes with achievements. After only seven months as a fulltime athlete under the coaching guidance of Charles van Commenee, the UK Athletics Technical Director for Combined Events, Sotherton leapt to second place in the World heptathlon rankings behind the World Champion Carolina Kluft (Sweden). She did so by scoring a personal best of 6406 points to finish second at the IAAF Combined Events Challenge meeting in Gotzis, Austria, on 29-30 May. In the highest quality competition of her life, she reeled off lifetime bests in five of the seven events to improve sensationally on her previous best, 6059 points at last season’s Spar European Cup of Combined Events. “Fantastic!” commented van Commenee, who is not noted for sound bite praise of his charges. Even now, with the season about to reach its climax in Athens, she is third in the current World rankings behind Kluft, who totalled 6820 in Gotzis and 6769 at the Spar European Cup of Combined Events in Tallinn in June, and Svetlana Sokolova (Russia), who totalled 6594 in Tallinn. As if that isn’t impressive enough, she reeled off more PBs in single events seemingly at will as the season developed ... 1.78m in the high jump (ranking her ninth in the UK) at Woerden, Netherlands, on May 20; 13.29 in the 100m hurdles (ranking her fourth in the UK) and 23.57 in the 200m (ranking her seventh in the UK) at the Bedford International Games on 13 June; 6.68m in the long jump (ranking her second in the UK) at the Spar European Cup in Bydgoszcz, Poland, on 20 June. As for her weakest events, the throws, her javelin best is now 40.81m (only two years after she managed 27m at the Commonwealth Games) and her shot put has improved beyond 13.60m – nothing to write home about in comparison with global standards but a considerable notch or two above her previous PB of 12.77m that had stood since 2002. One can only imagine the hard work throughout last winter that has led to these improvements, especially in the events in which she has traditionally struggled. For the javelin, for example, medicine ball work, weights and endless strength and conditioning seemed to be having no positive effects for weeks and months. But she persevered. And at the Norwich Union Athens Preparation Camp in Cyprus during the springtime, UK Athletics Technical Director for Throws John Trower helped her with her medicine ball routine. “The next weekend, after thousands and thousands of throws, it just clicked,” recalls Sotherton. “I thought it was like Denise in 1994 … absolutely great.” Denise Lewis sealed her heptathlon victory at the 1994 Commonwealth Games with an amazing javelin PB of 53.68m – an achievement that launched her on her progression to the 2000 Olympic Games Gold medal. 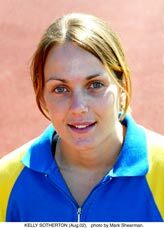 Kelly Sotherton took the Bronze medal in the Women's Heptathlon at the Athens Olympics. Her runaway victory in the 800m was not quite enough to boost her into the silver medal position, but nevertheless she set a trend among the GB team by wearing a flag around her waist during the medals ceremony. 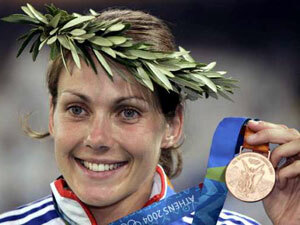 AN Olympic medal will take Kelly Sotherton off the pages of Athletics Weekly and on to a much higher platform. AW's coverstar on August 11 will now have entered the consciousness of the national public, the millions of casual athletics fans who are only really familiar with the top dozen or so athletes in the British team. So how does she feel about going on A Question of Sport, perhaps, this autumn? "Hmmm," she says, pondering the question. "It sounds okay. I'm a bit of a statto so I reckon I could get a few questions right." But then she stops, checks back, and her new-found athletics discipline takes over. "I'd probably only do stuff like that for the next few weeks, though. Come November I'll be back in hard training." November? More like this week. With coach Charles van Commenee cracking the whip, the 27-year-old is due to start stretching and striding today (Wednesday) and will compete in the multi-events contest in Talence in September. After guiding Denise Lewis to Olympic gold in Sydney and now another Birchfield Harrier to bronze in Athens, Van Commenee has proved himself the master coach. His 'Sweetenham-style' approach to preparation could also be what UK Athletics is looking for when they appoint a successor to Max Jones, the performance director. Famously, on the eve of the Games, he said Sotherton had little chance of winning a medal. It was a ploy, says Sotherton, to take the pressure off her. "But I still wanted to prove him wrong," she added. Then, after her 800m in Athens, the UKA technical director for jumps and combined events apparently accused his charge of not giving 110 per cent. Before Van Commenee got hold of Sotherton she was a competent heptathlete, but hardly one setting the world alight. She was the English No.2 behind Julie Hollman going into Manchester 2002 and finished seventh. Then, she almost switched to 400m hurdles after clocking 58.72 but after securing Lottery money she was able to ditch her job as a debt collector for a bank and go full-time as an athlete. She has even admitted her previous training was only half-hearted - while coached by Trevor Marsay - and she was too partial to fish and chip suppers. During the winter she has used the new indoor training facilities at the high performance centre in Birmingham under the watchful eye of Van Commenee and alongside the rehabilitating Lewis. She went into the summer with a best of 6059 but then set five personal bests en-route to a 6406 score in Gštzis, which put her second behind Carolina Kluft. She has improved her javelin mark by eight metres while her trump card event, the long jump, has been spectacular all season, with a best of 6.68m almost keeping Jade Johnson out of the British Olympic team. At the GB training camp in Cyprus she ran a 600m time trial in 1:28, which buoyed her confidence and led to observers such as Kelly Holmes to remark that "this girl is worth watching in Athens". Then, in Athens, she performed to the best of her ability, handling immense pressure in the long jump and 800m especially, to win a medal. In the long jump she fouled her first two jumps and had only one chance left to register a mark. She put her marker back about 3ft on the runway, but even then hit the board with only an inch or two to spare to reach 6.51m. In the 800m she had to beat Austra Skujyte by more than five seconds to win silver and she fell just short - front-running 2:12.27 to Skujyte's 2:15.92. "I was so drained, mentally drained," she said, adding that she had had about seven hours' sleep in the two nights preceding the final day of competition. "But I took it (the 800m) out and did my best." All of which is quite a journey from humble days spent growing up on the Isle of Wight, where she was born. Always talented, she played netball for Hampshire in her teens and won two English Schools' titles. But until this year little pointed to her being able to win a medal at the Olympics. She just needed a canny coach with a steel-toed boot to bring out the best in her. ISLE of Wight star Kelly Sotherton confessed it will take time for the "enormity" of her Olympic medal-winning achievements to sink in. The 27-year-old grabbed bronze in the heptathlon on Saturday night - and if she had run two seconds faster in the final event, the 800m, she would have pipped Austra Skujyte to the silver medal. "I went out to get the silver medal so I'm actually disappointed," Sotherton said. But the Birmingham-based athlete, whose training partner and Sydney gold medallist Denise Lewis was forced to pull out of the event through injury, added: "I only did one personal best over the two days and my javelin was poor. "But I got a bronze medal and I don't believe it. I can't believe the enormity of an Olympic bronze. I had a dream of a medal, but this is a surprise. "All it feels like at the moment is as if I won bronze in a national championships - but I'm sure it will sink in soon." Sotherton had been in silver medal position after an excellent long jump, her best event. But she could manage only 37.19 metres in the javelin and, despite a gutsy run in the 800, Skujyte held on. Carolina Kluft, the European and World champion, won the event by 517 points. Olympic bronze-winner Kelly Sotherton closed her heptathlon season with a win in Sunday's Decastar meeting in France. Sotherton, the overnight leader after the first day's action in Talence, maintained her motivation after a long season to dominate the competition. The Birchfield Harrier totalled 6,242 points, well ahead of Ukrainian runner-up Natalya Dobrynska (6,010). Sotherton was a surprise third at the Olympic Games last month after winning four of the seven events. Former world champion Yelena Prokhorova of Russia was third in France with 5,887 points. KELLY SOTHERTON is finding it hard to come back down after the emotional high of winning an Olympic medal. The Isle of Wight-born athlete, 27, claimed bronze in the women's heptathlon in Greece last month. Had she gone two seconds faster in the final event, the 800m, she would have won silver. Sotherton, who lives in Birmingham, has confessed she now has to handle greater pressure and public expectation - starting with next year's World Championships in Helsinki. "I've been completely overwhelmed by the response I have got since I got back to Britain," she said. "I went down to the doctors the other morning and even she knew who I was and took time to congratulate me. "In myself, I must admit to feeling emotionally drained, but I think a lot of athletes feel like that after coming back from an Olympics. "Apart from that life seems to be going on as normal. I don't think the realisation of what I have achieved has really hit me yet, and it might not do so for quite a long time to be honest. "I now know as well that there will be a whole load of different pressures on me come next year's World Championships. "In my own head, I knew I could win a medal this time round, but nobody in the media was saying that. "I didn't make my thoughts public though, because I didn't want to put any added pressure on myself. "Next year a lot more will be expected of me from others and that is something I need to learn to deal with. "I can handle that and hopefully I can deliver on it." Sotherton was just one British athlete in Athens to benefit from Lottery funding. The extra financial help she received helped her to give up her day job in a Birmingham bank and concentrate full-time on her Olympic preparations. "I know I am at a new level now, and I want to take time to thank the British public for the support they have given me through buying their Lottery tickets every week," she admitted. "The funding I have received from the National Lottery through UK Sport has been invaluable, allowing me to give up my part-time job and focus fully on my athletics. "I have my own idea in my head of what I want to achieve every time I compete. "In Athens there was a slight sense of disappointment that I only got the bronze in the end, as it could have been silver. "It has been well reported that my coach Charles van Commenee was quite hard on me after the last event in my heptathlon, the 800m, where he felt that I could have gone harder for silver. "But that moment is gone now. At the end of the day I have to get on with my life. "I felt that I approached Athens in the right way and I will be replicating my approach at the Worlds next year." Sotherton expects training partner Denise Lewis to bounce back from her Olympic misery - the Sydney gold medallist pulled out of the heptathlon midway through the event through injury. "I would like to have seen her finish. "She may regret not doing that - possibly for the rest of her life," said Sotherton. "But she has a bronze and a gold medal from previous Olympics, so she has already achieved all there is to achieve. "I fancy her to come back stronger from this and I fully expect her to be there in Helsinki." KELLY SOTHERTON has revealed how she may coach herself when Charles van Commenee takes up a new technical director's role in Holland in the new year. Sotherton won Britain's first track and field medal at the Olympic Games in Athens when she took surprise bronze in the heptathlon. She then made headlines because of Van Commenee's criticising her for not going faster in the 800m, the last event. She won her heat, but missed out on overall silver by 11 points. Yet despite that upset, Sotherton, 27, has talked about the inspiration she gains from Van Commenee, even if some of his guidance might not be that you would find in a coaching manual. He was on the shortlist for the position of performance director at UK Athletics but has chosen to return to his native country to become technical director of the Netherlands Olympic Association. 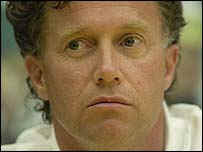 Van Commenee, who guided Denise Lewis to Olympic heptathlon glory in Sydney in 2000, is UKA's technical director for combined events and jumps and was among the favourites to succeed Max Jones, who retires as head coach in March. But Van Commenee's exit means Sotherton will need to find a new coach, though she may do it herself. She said: "He is not going until January and we are going to chat in the next couple of days about what I can do. He is going to help me to be able to coach myself, perhaps write my own programme and be in charge of my own coaching, but I can still use people around me for technical advice on how to set my own programmes. "It is good for me because I want to coach after I finish athletics. He will always be at the other end of the telephone or an email, he will always be my advisory. I'd have to draw on three or four individuals who will help me instead of one coach." But she could not believe Van Commenee's complaint in the moment of her glory in Athens. She added: "I don't think many people in this country liked him after what he said when I had won my medal. But I have forgiven him. He says things for a reason and to get my back up so I can prove him wrong. "Since then he has regretted what he did and he has apologised to me. "What athletes want are results. My motto this year is what Denise Lewis told me: Keep your eyes on the prize. It is all that you think about. It does not matter how you get it or how harsh your coach is, if he can get that for you, then that is all you think. "There have been some harsh times. Even Denise has said 'bloody hell Charles, you did not have to say that'. But he has done everything for a reason and those reasons have paid off." 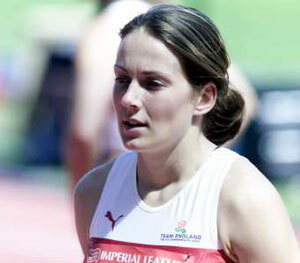 British heptathlete Kelly Sotherton admits she has concerns about London's bid to host the 2012 Olympics. Just two days before Lord Coe unveils details of London's candidature, the Olympic bronze medallist said: "I must admit I'm not 100% behind the bid. "I know it'd be a good thing for London but last year I went to Barcelona and the Olympic stadium was desolate. "My fear is the whole area set aside for the Games here would become a white elephant - like the Millennium Dome." She added: "If it happened, of course I would be happy with that. "I will only be 35, so you never know - maybe I would have one more Olympics left in me and it would be great to bow out at a Games hosted by my country. "And I gather it is only supposed to be adding a small amount to people's Council Tax. But I don't think that it is completely viable." Sotherton was speaking at a media day for the Norwich Union Grand Prix on 18 February. She will take on Athens heptathlon champion Carolina Kluft at the meeting. The Birmingham-based athlete will face Kluft in the 60m hurdles and long jump at the city's National Indoor Arena. Sotherton ended the year second behind the Swede in the rankings after winning the last IAAF Combined Events meeting of the season in Talence. Her main aim for 2005 is to finish in the medals at the World Championships. Before that event in August, she will challenge for honours at the European Indoor Championships in Madrid in March. The 28-year-old said: "I've been back in full training since the beginning of November. "I hope to win medal in Madrid and then I will compete in Gotzis at the end of May. "If I get a decent enough score there, it will be a case of not doing another one and preparing myself for Helsinki and the World Championships." Kluft, who will be making only her second appearance at a British meet, said: "It will be a good competition for me before the championships in Madrid." Kelly Sotherton will continue to work with coach Charles van Commenee, despite his public criticism of her in Athens and his move to the Netherlands. Van Commenee, who has taken an athletics post in his native country, accused the British heptathlete of "running like a wimp" at the Olympics. The Birchfield Harrier missed silver by a second after her efforts in the 800m. But Sotherton said he will remain her advisor and she will use specialist event coaches in his full-time absence. Unusually, Sotherton will oversee her own training schedule and look to a team that includes John Trower - Steve Backley's javelin coach - and Aston Moore, Ashia Hansen's triple jump coach, to help on technical issues. Max Jones, the former performance director of UK Athletics (UKA), will supervise her shot and Ted King will focus on her long-jumping and sprinting. "If I could find one person to do everything then I would, but I do not feel there is anybody, not in this country," the 28-year-old told BBC Sport. "Probably people think I am stupid, but there is nothing else I can do. "Of course it is bad timing with things just starting to happen for me on the world stage, but I just have to get on with it." Reflecting on her Olympic experience, Sotherton admitted tough-talking van Commenee, who guided Denise Lewis to Olympic heptathlon gold in Sydney 2000, had spoilt her party with his outburst. "Obviously Charles was very upset by Denise going out and me getting the bronze when the silver was so close. "But if he was going to have a pop at me, I would have thought it would have been behind closed doors, not in front of the press. "I would rather forget it because even though it should have been the best day of my life, it wasn't. "What was said was the reason why I am not as excited as I should be about winning a bronze medal. "But after that we had 4-5 days apart and then had a chat and he said 'you know we have come a long way in under a year - further than we thought we ever could'. "Yes, he is a hard man but he is also one of the best - if not the best - multi-events coach in the world and I look to the positives in Charles. "He is very passionate about his coaching and athletics and that's what makes him good." Van Commenee started working with Sotherton in March 2003 and in just 10 months took her from outside the world's top 20 to the Olympic podium and number two in the global rankings. Sotherton also refuses to rule out working with the Dutchman, who left his post of technical director with UKA to become technical director of the Netherlands Olympic Committee, on a full-time basis again in Britain. And she believes UKA "have missed a trick" by not appointing him successor to Jones. "You never know what is going to happen in the future, but it is unfortunate that he has gone abroad because he has so much to offer," she said. The hugely talented Swede will compete in both the long jump and 60m hurdles at the meeting on 18 February. The Olympic heptathlon Champion will go head-to-head in both events with local favourite Kelly Sotherton, who finished third behind Kluft in Athens. 60m hurdles (8.15 seconds): UK record holder Sarah Claxton (Belgrave Harriers) scored her most significant victory yet in a time of 7.98 seconds. Kelly Sotherton (Birchfield Harriers) was ninth in 8.43. 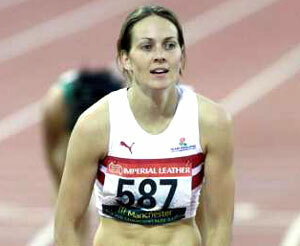 Kelly Sotherton has continued her fine form this season by storming to a new UK indoor 100m hurdles record. The Olympic heptathlon bronze medallist clocked 13.52 seconds at the opening of a new sports complex at Brunel University on Wednesday. Former Olympic 400m hurdle champion Sally Gunnell had held the previous mark of 13.71 set 20 years ago. "I knew I was going to run about 13.5," said Sotherton. "I am pleased because it's a new track, so it's not so fast." Sotherton is preparing for the opening event of her outdoor season at the Gotzis International in Austria at the end of May. The 28-year-old has already improved her indoor personal bests in four disciplines - 60m hurdles, high jump, long jump and shot put - this season. Shot: Kelly Sotherton began her four-event weekend by taking fifth place, reaching 13.77m with both her fifth and sixth efforts. Long jump: In the most dramatic final of the day, Jade Johnson (Herne Hill Harriers) held her nerve to achieve a European Indoor qualifying mark and win the title with her sixth and last leap … after Olympic heptathlon Bronze medallist Kelly Sotherton (Birchfield Harriers) had led from the first round with an indoor PB of 6.43m. 60m hurdles: Olympic heptathlon Bronze medallist Kelly Sotherton (Birchfield Harriers) ran her second hurdles PB of her extremely encouraging weekend, finishing in 8.40. 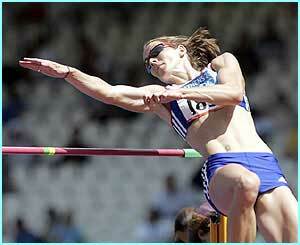 Pre-race: Sotherton intends to launch her new season with outings in the 100m hurdles, high jump and javelin. Olympic heptathlon bronze medallist Kelly Sotherton (Birchfield Harriers) heads for her 15th competition of this summer determined to ease her World Championships disappointments. Six weeks after finishing fifth in Helsinki, Kelly goes head to head against World silver medallist Eunice Barber (France) at the Decaster meeting in Talence, France, on Saturday and Sunday, the final contest of this year’s IAAF Combined Events Challenge. While Barber will be aiming to increase her French record of 6889 points, achieved in Arles earlier this summer, in an effort to overtake World and Olympic champion Carolina Kluft at the top of the Challenge standings, Kelly knows she needs to score 6350 or better to finish in third place in the rankings that are highly rated by the athletes. That is 108 points more than she scored when she won in Talence 12 months ago. Kelly, who opened this season by scoring 6547 at Gotzis, Austria, in May but then had to settle for 6325 when her long jump and javelin were below par at the World Championships, said: “I don’t rate myself fifth in the world. I believe I am third in the World. The IAAF Combined Events Challenge comprises each athlete’s best three scores from the year’s top meetings around the world. Of those who have already completed their three competitions, Kluft leads with an average of 6799.67 points. Kelly Sotherton (Birchfield Harriers) is on course for a top three finish in the IAAF Combined Events Cross Challenge after the opening day of the Decaster meeting at Talence, France, on Saturday 17 September. The Olympic Bronze medallist overcame a below par high jump to battle her way into second place, behind World Championships Silver medallist Eunice Barber (France). Determined to ease the frustration of finishing fifth at last month’s World Championships in Helsinki, Kelly accumulated 3797 points from the day’s four events, which is only 114 down on her performances at Gotzis in May when she went on to her lifetime best total of 6547 from the seven events. She opened with a 100m hurdles time of 13.32 seconds, only five hundredths of a second down on her best ever, to earn 1077 points but then had to settle for a 1.75m clearance in the high jump, 8cm below her best and worth only 916 points. She bounced back brilliantly with a best ever outdoor shot put of 13.91m (788 points) and ended the day with a 200m victory in 23.64 seconds, within seven hundredths of a second of her fastest yet and worth another 1016 points despite having to run into a head wind of 1.2 metres per second. It meant that Kelly defeated Barber in the last two events. The French record holder put the shot 13.65m and clocked 24.08 seconds in the 200m. But she held the overnight lead with 3941 points, having exploded into action by winning the 100m hurdles in 12.96 seconds and high jump with 1.87m. Nataliya Dobrynska (Ukraine) is third on 3698 points. And that would be good enough to propel her into at least third place in the IAAF Combined Events Cross Challenge standings, which are headed by Olympic and World Champion Carolina Kluft (Sweden), who has already finished her competitive season. Kelly Sotherton (Birchfield Harriers) overcame more Helsinki-like horrors to finish third in the prestigious IAAF Combined Events Cross Challenge series. The Olympic heptathlon bronze medallist suffered almost as badly on the final day of the series at the Decaster meeting in Talence, France, as she did when she finished fifth at last month’s World Championships – but she persevered to earn third place overall behind the World and Olympic Champion Carolina Kluft (Sweden) and World Silver medallist Eunice Barber (France). With Kluft having already completed her three competitions in the series, Kelly started the last day of the final heptathlon of this summer in second place to Barber. But Kelly’s long jump, 6.39m for 972 points, was 29cm down on her best and 2cm worse than in Helsinki. 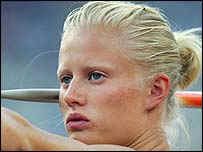 And her javelin throw of 34.79m (568 points) was 6.02m below her best, dumping her down to fifth place – as in Helsinki. And that is when her fighting spirit emerged. She won the 800m in 2 minutes 11.60 seconds, so far ahead of her rivals that she earned 941 points and climbed back into second place in this heptathlon. And her total of 6278 points was enough to hoist her above her main rivals for third position overall, Olympic Silver medallist Austra Skujyte (Lithuania) and World Bronze medallist Margaret Simpson (Ghana). Kelly’s average from her three heptathlons in the series was 6383.33, taking her 66 ahead of Skujyte. Kluft finished top with an average of 6799.67 – just 3.67 points ahead of Barber. The French champion won the Talence competition with 6675 points while Kelly’s total of 6278 was matched by the World University Games champion Lyudmila Blonska (Ukraine). Kelly took second place by virtue of having finished ahead of Blonska in five of the seven events. On the first day, Kelly accumulated 3797 points from the day’s four events, which was only 114 down on her performances at Gotzis in May when she went on to her lifetime best total of 6547 from the seven events. And she bounced back again from her second day disappointments to achieve her main aim - to prove she is among the world's top three heptathletes. Preview: Sotherton was one of the surprise packages of the Olympics when she won bronze in the heptathlon, and only last month she showed just how much she is building on that when she finished second to the Athens champion Carolina Kluft in Gotzis. Only one event for the Birmingham-based athlete this weekend but the long jump is arguably her strongest discipline and Britain will be hoping for maximum points from her. Olympic bronze medallist Sotherton matched her personal best in the long jump and ran her fastest ever 60m hurdles at the Norwich Union International in Glasgow. Pre-race - Jade Johnson (Herne Hill Harriers) is back in action in the Women’s long jump. She failed to register a jump in her first competition for a year last weekend in Cardiff but will be looking to make it count in Sheffield. Gillian Cooke (Edinburgh Southern Harriers), now 23 re-wrote the Scottish record books at the same meeting and will be aiming to go even further, in her build up to the Commonwealth Games. 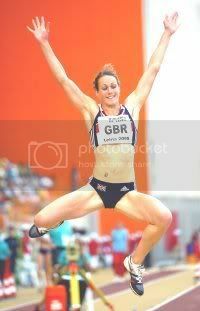 Kelly Sotherton (Birchfield Harriers) is also in the line up for the long jump and could challenge for the Gold medal. Kelly Sotherton (Birchfield Harriers) might have taken an impressive victory with an Indoor PB of 6.53, but it was the smiling Jade Johnson (Herne Hill Harriers) who had most to celebrate with silver, and her first completed competition for over a year. “It’s nice to have Jade back – it’s more competitive, and as a result people look forward to the women’s long jump when they know there are two athletes who are in competition. Long jump star Jade Johnson says Kelly Sotherton "lacks respect" for her rivals following a furious row between the pair at the [Indoor] AAA Championships. Johnson said she was fed up with Sotherton's "little digs" in the press and approached her for a private chat. But Johnson told BBC Sport: "She decided we'd have it in front of the media. I'm fed up with her talking about me. She should shut her mouth." In response, Sotherton said she just wanted to concentrate on her training. Johnson was competing for the first time in 10 months in Sheffield at the weekend after suffering a prolapsed disc, and was beaten into second place by Sotherton in the long jump. But she accused Sotherton, who won a bronze medal in the heptathlon in the 2004 Olympics, of "shouting and raving" when confronted after their medal presentation about what Johnson perceives to be a lack of respect. The pair eventually had to be separated by security staff. Johnson, who won silver at the Commonwealth Games and European Championships in 2002, said: "It has been going on since 2004 and I decided to have a private chat with her. "I wanted it to be a discussion between two adults but I ended up talking to a child. "She is trying to give the perception that she is the sweet and innocent one and I'm deranged and I don't think she should be able to get away with it. "It's not just me she talks about, it's other people. She doesn't seem to have any respect. "It's not like we work in an office. It is going on TV and in the papers and I am sick of people asking me if I have seen what she has said. "People let her disrespect whoever she wants but my mum brought me up to not let anyone disrespect me." Sotherton said: "I don't really want to make a comment. All I want to do is concentrate on my training for the Commonwealth Games." The pair are set to meet again at the Norwich Union Grand Prix in Birmingham on Saturday. Kelly Sotherton (Birchfield) completed a hat-trick of consecutive years in the long jump at the European Cup, but admitted she was less than happy with her 6.50m effort that took fifth place.